Indian Kabaddi Team's captain, Ajay Thakur has been selected to be honoured with the highest civilian award in India, the Padma Shri Award on the auspicious occasion of Republic Day. The Padma awards are the most distinguished awards given for their exceptional service, contribution and dedication to their nation and represent to the highest level. Ajay Thakur is one out of nine sportspeople to receive the Padma Awards this year including Bachendri Pal (Mountaineering - Padma Bhushan) and Sunil Chhetri (Football), Harika Dronavalli (Chess), Gautam Gambhir (Cricket), Sharath Kamal (Table Tennis), Bombayla Devi Laishram (Archery), Bajrang Punia (Wrestling), and Prashanti Singh (Basketball) who will receive the Padma Shri Award. 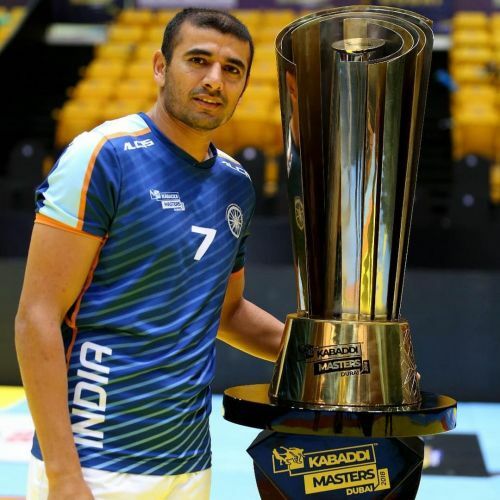 Ajay Thakur is known for his efforts of 2016 Kabaddi World Cup final which led Team India to win their 3rd consecutive World Cup which is known to have changed the landscape of Kabaddi in India. He was the top raider in 2016 Kabaddi World Cup with 68 raid points in the tournament (12 raid points versus Iran in the final). Ajay Thakur has had phenomenal success representing Team India in international platforms. Ajay Thakur has won gold medals for India on multiple occasions. This ex-Air India player won the gold medal in 2007 Asian Indoor Games and was a part of the winning team of 2014 Asian Games gold medalists. He captained Team India in the 2017 Asian Kabaddi Championship and 2018 Dubai Kabaddi Masters and led them to victories in the finals. As of now, Thakur is the Deputy Superintendent of Police (DSP) in Himachal Pradesh. Ajay became the 'Himachali of the year' back in 2014 as a part of the Himachal Pradesh Excellence Awards. Ajay Thakur has also served for the Indian Navy in the past as well. On behalf of Sportskeeda, we would like to wish many congratulations to Ajay Thakur to receive the Padma Shri Award on his well-deserved success and contribution towards Kabaddi. Asian Games 2018: Heartbreak at Kabaddi - Problem of plenty? Kabaddi World Cup 2019: How this event will transfigure the picture of Kabaddi? Exciting news for Kabaddi fans! World Cup Kabaddi 2019 set to kick off from April 2019. Thank you for the memories, Anup Kumar!